differ consistently in dorsal coloration pattern, which allows them to be identified in the field. Minor clones are nested in major clones and differ from one another by slight variations in allozymes. The nesting of minor clones within major clones suggest that they diverged within a major clone via mutation (Bolger / Case, 1994). It is considered that the diploid clonal lineages were derived from hybridizations between bisexual species. The triploid clonal lineages possibly originated through back crosses between the diploid clones and males of parental species (Cole et al., 1988; Darevsky, 1992; Moritz, 1983; Radtkey et al., 1995; Volobouev et al., 1993; Sources: Ota et al., 1989; Ota et al., 1996). It took a long time until the sexual ancestors involved in hybridization had been identified. In 1995 studies of Radtkey et al. revealed that Lepidodactylus lugubris is a cross between Lepidodactylus moestus (described by Ota et al., 1995) and an other undescribed species (Lepidodactylus sp.) from Arno Atoll (Marshall Islands) and that independent clone production through hybridization of these is probaby recent, ongoing and has occurred several times. Two parthenogenetic clones Lepidodactylus lugubris with the two parental species. 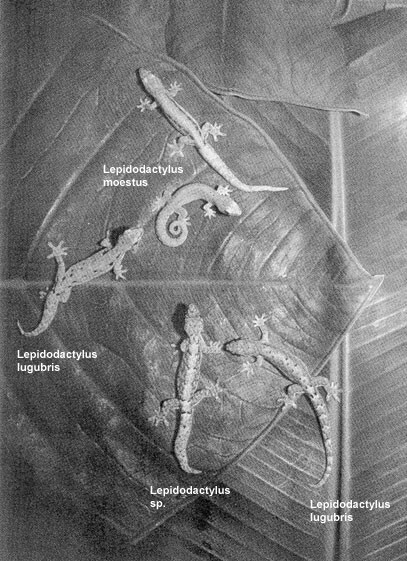 Two colour morphs of the maternal ancestor Lepidodactylus moestus are shown in the upper middle, the undescribed paternal ancestor is in the lower middle and two Lepidodactylus lugubris clones are middle-left and lower-right. Back pattern polymorphisms of the maternal species carry over into the Lepidodactylus lugubris clones. Photograph by J. Newsome. Boissinot et al. (1997) also assumed that the parthenogens originated on Arno Atoll where Lepidodactylus moestus and Lepidodactylus sp. coexist. Their investigations (1997) in French Polynesia (Moorea Island, Maiao Island, Society Archipelago, Rangiroa Atoll, Takapoto Atoll, Tuamoto Archipelago) showed that the bisexual species of Takapoto is not the parental population of the local clones, but may well belong to the parental species. Boissinot et al. (1997) suggest that the origin of clone A is independend from that of clone B, C and D and that clone B and C could have originated from hybridization between diploid clone D and males of different bisexual populations. Moritz et al. (1993) indicate independent origins of the diploid clones 2nA, 2nB-I and 2nB-II. They assumed that triploid clone 3nB possibly arose by fertilization of diploid 2nB by males of sexual species and a similar event involving a diploid 2nA female resulted in the triploid 3nA clone. The variety of different lineages in Lepidodactylus lugubris still is not well studied yet. The lineages are determined with reference to the descriptions of Ineich (1988). Less than 7 spots restricted to the anterior medio-dorsal band. Dorsal pattern of lateral black bars on the neck and base tail, chevrons and short bars alternating with each other along the middorsal line, a relatively distinct w-shaped mark on the head (Yamashiro / Toda / Ota, 2000). Except for the clone 2nA-III from Hawaii A back pattern (Ineich, 1988), regular paired mid-dorsal chevron markings. Clone 2nA-III on Hawaii has additional marks on the side of the neck (Moritz et al., 1993). Clone B back pattern (Ineich, 1988) with strong lateral markings on the neck and irregular dorsal markings (Moritz et al., 1993). back pattern resembling the clone D back pattern (Ineich, 1988) with the small numbers of mid-dorsal markings, except that the markings are posterior rather than anterior (Moritz et al., 1993). Clone A back pattern (Ineich, 1988; Moritz et al., 1993). Variable, sometimes clone B-like back pattern (Ineich, 1988; Moritz et al., 1993). Often crosses between clones and bisexual males result in hybrides with degenerated reproductive gonads. These animals may show female or male characteristics. Studies of Ivan Ineich and Hidetoshi Ota (1992) on Takapoto Atoll revealed that hybrides often were significantly bigger than bisexual Lepidodactylus sp. (at that time still also described as Lepidodactylus lugubris) or Lepidodactylus lugubris clones. The sterile hybrides studied by Boissinot et al. (1997) on Takapoto Atoll all were determined to be the result of mating between diploid clone A and males of the local bisexual Lepidodactylus sp.. No hybrides issued from fertiliation of females belonging to clone B, C or D were found. Boissinot et al. (1997) were not sure if this can be explained by the lower frequency of these clones or genetic or chomosomal incompatibilities between them and the bisexuals or if there are other reasons. If no males of other species are involved, usually hatchlings of eggs laid by parthenogenetic females are also parthenogenetic females. So, in many reports about "male" Lepidodactylus lugubris later turned out that the specimen was a male of a closely related Lepidodactylus species or a hybrid. But there are exceptions. 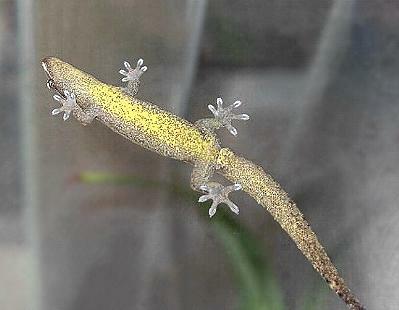 Rösler (1992) reported two well developped males, which hatched under terrarium conditions from eggs of Lepidodactylus lugubris. Unfortunately he did not indicate if the males were fertile. As the origin of the mother geckos could not be determined, he was not sure if one of the two females was bisexual, but assumed that both were parthenogenetic and males hatched for uncleared reasons. Orlando Cuellar and Arnold G. Kluge (1972) reported that the seemingly anomalous shape and surface texture of the testes in most of the Lepidodactylus lugubris-"males" suggests that spermatogenesis could not have proceeded mormally. Furthermore in the case of Lepidodactylus lugubris there are some circumstantial data indicating that the males may not be of hybrid origin. In the first place hybrid individuals usually exhibit phenotypes deviating from the normal condition of either parent species. The males that Cuellar and Kluge found were not obviously different from the typical female Lepidodactylus lugubris phenotype. 1998 Yamashiro and Ota described a sterile "male" of Lepidodactylus lugubris from Ishigakijima Island (Yaeyama Group, Ryukyu Archipelago) which looked the same as the local clone C females and also because of a lack of related species could not have been a product of hybridization. They assumed that the "male" had developped from a normal clone C because of hormonal changes. 4 individuals showed male characteristics. Radtkey et al. 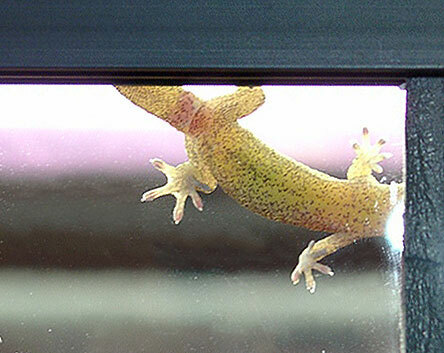 (1995) even indicate only 5 "males" among over 8000 geckos on Hawaiian Islands and Marianas Islands. Now one of my own juveniles also seems to develop to a "male". This specimen hatched from an egg which was incubated at temperatures of sometimes around 30° C during summer. I don´t know if the high incubation temperature effected development to a male or if other factors were the reason. The male was more likely to approach females with no sign of egg development or small eggs than females with large eggs and was observed neck-biting and moving on top of females although no copulations were observed. Eventually either the male or the females did not possess the behavioural repertoire needed to respond to and complete a normal courtship and mating sequence. In studies of Brown et al. (1993) in groups consisting offemales only interactive behaviour decreased over time, reflecting a stabilization of the dominance relationships between the females. High levels of interactive behaviour were maintained between male / female dyads and females showed more aggressive behaviour than males. which most likely functions as a territorial spacing mechanism repelling other males (Marcellini, 1977b). My male gecko is mostly ignored by the females. Often he approaches a female with the "multiple chirp call" described by Brown et al. (1993), which sounds like a series of calls, each not unlike the single call of the females. A several times I saw him climbing over and below a female and thereafter repeatedly neckbiting and releasing. The female remained unimpressed during this procedure and after a while left the exited male alone.